Resveratrol is a naturally-occurring substance touted for its antioxidant, anti-cancer, anti-aging, anti-inflammatory and cardioprotective potential. Plants produce this fat-soluble compound in response to environmental stresses, including physical injury, fungal infection or sun damage. Scientists began exploring resveratrol’s health benefits when it was discovered in red wine in 1992, thinking that it may help explain the “French Paradox” -- the observation that heart disease is relatively low in France despite high levels of dietary saturated fat and smoking, due to regular consumption of red wine. Resveratrol is present in grapes, various berries, peanuts and Japanese knotweed. Grapes produce large amounts of resveratrol in their skins to protect against fungal disease and ultraviolet radiation. Consequently, grapes and the commercial products containing grapes, including grape juice and grape extracts, are significant sources of resveratrol. The common grape vine, Fox grapes, and Muscadine grapes contain the most resveratrol, with up to 40 times more resveratrol than common grapes. In general, the amount of resveratrol varies depending on the geographic origin, exposure to fungal infection and amount of fermentation time. Also, white and rose wines usually contain less resveratrol than red wines, as their skins are removed in wine-making process. Red grapes contain 0.24 to 1.25 milligrams of resveratrol per cup. 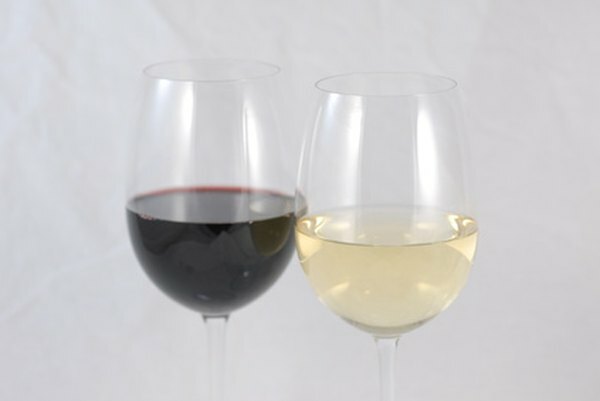 A glass, which is equal to 5 ounces, of white wine offers 0.01 to 0.27 milligram of resveratrol and an equal quantity of Spanish red wine contains 0.29 to 1.89 milligrams of resveratrol, according to the Micronutrient Information Center of the Linus Pauling Institute. Berries of the Vaccinum species, including blueberries, bilberries and cranberries, also contain resveratrol, but to a lesser extent than grapes. According to a study published in the September 2003 issue of the "Journal of Agriculture and Food Chemistry," heat processing, such as baking, degrades the resveratrol content by about 17 to 46 percent in these fruits. Peanuts, which are actually a type of vegetable since they are classified as legumes, are another rich source of resveratrol. There are 0.01 to 0.26 milligram of resveratrol in 1 cup of raw peanuts, while 1 cup of boiled peanuts has an even higher resveratrol content -- 0.32 to 1.28 milligrams. Heat processing does not seem to affect resveratrol content in peanuts, so peanut butter is another source of resveratrol. A 1-cup serving of peanut butter contains 0.04 to 0.13 milligram of resveratrol. Japanese knotweed has one of the highest concentrations of resveratrol found in nature in its edible shoots, stems, tips and seeds. This plant grows year-round in various climates and, as a result, some commercial supplements derive their resveratrol content from Japanese knotweed.